Can humanity continue our immoral doubling of population 45 more years? - Absolutely NOT! For the first time in history, in 2008 more than half of our planet's population lived in crowded urban environments. For billions of simple people, the rural environment can no longer sustain the essentials of life. Greedy agriculture corporations, patented genetically-modified seeds, and parasitic Wall Street commodity speculators have stolen the profit motive from family farmers. The need for expensive petroleum to grow food and transport it 1500 miles has become an unbearable burden. Farm bill subsidies reward the wealthy, and penalize small-scale organic farmers. Humanity refuses react appropriately to altogether-obvious unsustainable urbanization trends. We have been warned time and again, and we have ignored all well-documented life-critical warnings. There is NO GLOBAL ROADMAP, OR PLAN IN PLACE, TO DEAL WITH THE PREDICTABLE DIRE CONSEQUENCES OF NEAR-FUTURE CROWDED-CITY HUMAN POPULATION "INFESTATION" - Our Creator gave humans an observant brain with the potential for rational thought, and the ability to predict and plan for our future - BUT, we have become irrational non-learning creatures of endless extremely-bad habits. We can see that we are headed for a cliff at high speed, but we ignore the obvious warnings, and step on the gas pedal. HOW STUPID IS THAT? There is no working example of any city anywhere on earth that should be replicated in the future! (Not even the ones with "ecocity" in their misleading name.) If a Johnny-come-lately with a poor track record claims "It's the wave of the future" - Be scientifically skeptical - His unenlightened insufficient partial plan may be a deadly suicidal tsunami. Emerald Eco-City is essentially the ONLY published proposal offering complete experience-based solutions to ALL existing urbanization problems. Far too many highly-paid unenlightened architects, sociologists, and city planners assume that tomorrow should be similar to today's failing cities around the world. They cannot think "outside the box." They refuse to embrace a much-more cost-effective ecocity paradigm. They are about to be rudely confronted with their terrible lack of insight and innovation. IF human beings continue building more extremely-inefficient filthy cities in the future (to accommodate earth's predictable exponential population explosion), our worldwide infrastructure, and complex, unsustainable, economic systems, must surely collapse (soon). Will humanity be able to reverse our deadly doomsday urbanization scenario in time? If you try to evaluate Zero Energy Design's Emerald Eco-City proposal, based on its lack of similarity to today's obsolete, flawed, pervasive urban environments, conventional, declining, business-as-usual thinkers will reject most of what we suggest. It would be like trying to evaluate Henry Ford's 1908 Model T automobile, by comparing it to a horse. Future problem solvers MUST adopt radical new paradigms and sustainable, efficient, architectural and social design patterns. Emerald Eco-City can only be correctly evaluated on the basis of what SHOULD be, not what now exists, (which is already in rapid decline). A growing number of people in one already-overcrowded expensive city is NOT a measure of success. It is a measure of near-term disaster. How did humans survive before we thoughtlessly doubled Earth's population since 1967? Before rural electrification and petroleum-powered farm equipment, muscle power (from horses, mules, oxen, and especially humans) was required to feed our society. In 1900, there were only 76 million Americans, mostly living in rural communities. Electricity and gasoline cars were extremely rare. 41% of Americans (roughly 30 million) were farmers little more than a century ago. Today, USA has over 300 million people to feed, and less than 2% (perhaps 4 million, depending on the definition of a “farm”) grow far more food for four-times more Americans PLUS starving people around the world. 90% of farmers have to work at other jobs to make enough money to operate their farms. Only about half-a-million U.S. farms are classified “commercial farms” with over $50,000 of gross annual sales. Where did the 41% farmers of yesteryear go? and sad burden on their families. The above table shows that the rate of population explosion is slowing somewhat. Birth rate is stabilizing, BUT Death Rate Is Increasing, due to over-exploitation of resources. Earth can NOT support current population at current consumption rates. The worldwide proportions of urbanization rose dramatically from 13% (220 million) urban sprawl dwellers in 1900, to 29% (732 million) in 1950, to over 50% (3.4 billion) today. The overcrowded urbanization trend is now accelerating worldwide. If human population doubles again in 45 years, Earth would be infested with 14 BILLION (mostly-starving) people by 2057 – which is TOTALLY INFEASIBLE. Almost no one believes that our recent population growth rate is even remotely possible in the near future. It absolutely CANNOT BE SUSTAINED. Without a doubt, we MUST have fewer worldwide births, more deaths, or both. No other earthly options are on the distant horizon. If population were to continue to double every 45 (or fewer) years, in a few hundred years every square meter of all land on Earth would have a person on it. No one could lay down to sleep. 45 years later, there would be TWO people there. There would be no room for life-giving trees, or growing any food at all. In little more than two millennia (the time since year 0), the mass of humans would explode to become greater than the mass of the entire Earth – which is way beyond ABSURD. HUMANITY HAS NO CHOICE BUT ZERO POPULATION GROWTH ! In contrast, Will Rogers wrote: "Live your life so that whenever you lose, you're ahead." There seems to be NO effective politician, strategic advisor, or greedy corporate CEO who understands Zero-Growth-Rate Sustainability, or the trivial grade-school arithmetic of devastating Compound Population Growth. Their greed is insatiable. Their selfish shortsighted agenda is apparently personal power, with total disregard for posterity. They all place their blind faith in IMPOSSILE Ponzi-scheme endless continual economic growth - which is clearly mathematically infeasible. They are so very convinced in their foolhardy behavior that they place a gigantic immoral generational-theft burden of unpayable debt on our grandchildren. When their criminal organized-crime Ponzi scheme began to crumble in 2008, they increased their deficit-spending behavior that had created the irrational national insanity in the first place. We have done nothing to punish the criminals, or correct the underlying source of our multiple crises. The worst is yet to come. Immutable Sustainability Rule #1 – Any strategic plan for our future MUST Include ZERO Human Population Growth Rate. Earth is already way overpopulated. A billion people are now starving on less than one cup of food a day. A major portion of all humans are trying to live on less than $2 per day, while the price of their scarce basic food is doubling. Even well-education young people cannot find living-wage jobs. There is much work that needs to be done, but obviously no current way to pay our continually-growing population to do it. "Be fruitful and multiply" without restraint has become an obsolete and immoral suicidal commandment. Voluntary conception control is NOT a sin - It has become a moral imperative for all of the multitudes. There is NO such thing as ANY population growth rate at all that can be considered sustainable – Not Even 1%! 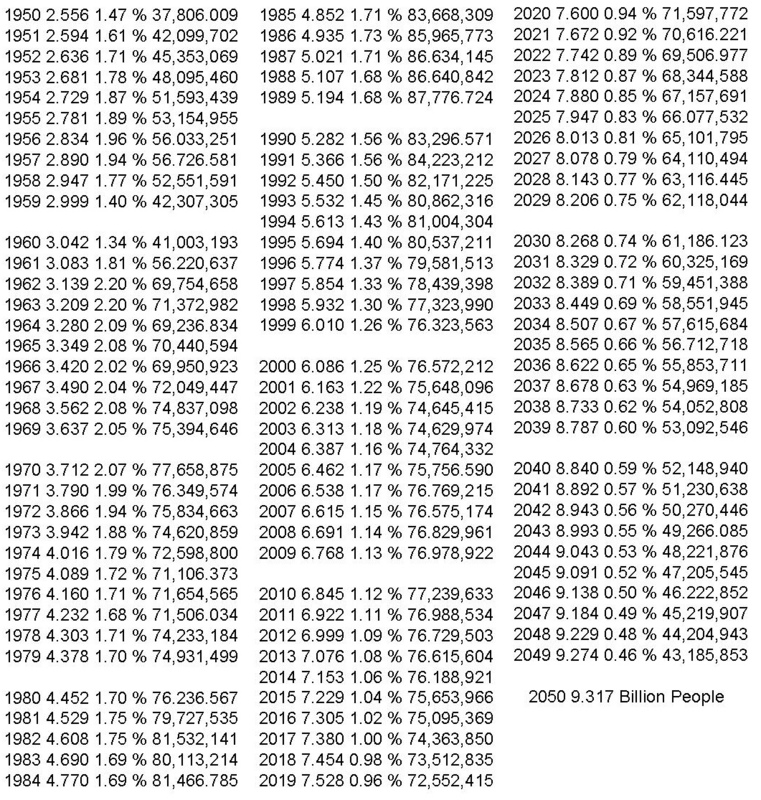 If net population grows year-after-year, it will eventually double and redouble catastrophically. Earth can NOT support the people who are already on it. Death rates must increase soon. Ignoring unpleasant scientific facts does not make them go away. If ANY politician, advisor, consultant, or CEO begins a strategic presentation with an assumption of ongoing growth of 3% (etc. ), THEN do not waste your time listening to anything they say thereafter - it cannot possibly be true. They obviously do NOT understand the significant implications of repetitive grade-school multiplication - doubling and redoubling over time. They should be immediately fired or impeached for their fraud, deception, or total incompetence. We know for absolute certain that NO big-bad-blue-chip company (like General Electric, General Motors, Exxon, or IBM) can possibly sustain a 3% growth rate forever. Anyone who understands basic arithmetic has the ability to calculate precisely why in only a minute. BUT, almost everyone allows their bad leaders to base future strategies on a "conservative" all-American 3% growth rate. They are shortsighted FOOLS with no powers of observation or critical thinking skills. EVERY effective worthwhile strategic plan MUST acknowledge the steady-state leveling-off point where no more growth is possible. Wall Street always refuses to do this. Insane pervasive parasitic speculators created the 1930's Great Depression, and then non-learning morons repeated it during Great Recession of 2008 that blew a $15 TRILLION hole in the U.S. economy. In 1956, M.K. Hubbert accurately predicted Peak Oil American petroleum production in 1970. He was ABSOLUTELY ACCURATE, but much-higher-paid continual-growth oil industry "experts" laughed at him. We now know scientifically beyond any shadow of a doubt that the myopic math-challenged majority of American business and political leaders and blind-faith followers were just FLAT WRONG. IF USA had listened to Hubbert, or learned anything from OPEC in 1973-1979, then al Qaeda would have had zero funding, they would have no reason to get mad at us for steal Arabian oil at paultry prices, and 9/11/2001 could not have happened the way that it did. In 1990, did anyone's strategic business plan realistically include the collapse of the global economy in 2008? We are now very-predictably on target for the double dip stock market crash (sometime in 2011-2012?) that will produce the WORST Depression in American history. It will take the entire global economy down with us when the U.S. dollar collapses. Rebuilding could take decades. No city or national economy can possibly maintain a 3% growth rate forever. Any such assumption is FALSE. Anything based on continual compound growth is a CRIMINAL PONZI SCHEME - just like Bernie Madoff, who was imprisoned for life for his crimes against his own "friends". It WAS "Too good to be true." Medicare and Social Security (the largest portions of the impossible U.S. budget) and all underfunded private pension plans MUST go bankrupt in the 21st century (or be drastically cut in half again and again). "Quantitative Easing" "Monetization" of $14 Trillion of U.S. national debt MUST force the total collapse of the U.S. dollar in the 21st century. We can NOT simply transfer unpayable debt to our precious unborn grandchildren, and lie to ourselves that future compound growth will make all of the problems we created magically vanish. It is SIMPLY IMPOSSIBLE to violate Immutable Sustainability Rule #1 for very long - DO NOT BE DECEIVED BY LIARS! Immutable Sustainability Rule #2 – Any strategic plan for the future MUST demand the decline and ultimate elimination of ANY dependency on all non-renewable (or slowly renewable) finite resources - Nothing else is even remotely possible in the future - Ignoring scientific facts does NOT make them go away - Failure to understand basic arithmetic does NOT mean that you know more about the future than scientists have predicted - Inaction is self-imposed suicide. Fossil fuels and nuclear power are obviously-unsustainable in the 21st century, but even slow-growth renewable trees that take more-than-a-decade to restore, are UNSUSTAINABLE, when we are insanely killing 50,000 to 100,000 acres of trees EVERY DAY. Nature absolutely can NOT permit violation of Rule #1 or #2 for long. Biased corporations, lobbyists, and corrupted politicians FALSELY claim that resources like coal will supply our American energy needs for centuries. This is a bald-faced LIE, or the words of idiots who do not understand simple multiplication and addition arithmetic. Half of American electricity still comes from dirty deadly unsustainable coal. It is also used heavily in industrial processes like making steel. THERE IS NO SUCH THING AS COST-EFFECTIVE “CLEAN COAL” – even on the remote future horizon, despite endless coal-industry political LIES that contradict science. If you repeat a big bad lie long enough and loud enough, fools with no critical thinking skills or understanding of arithmetic will eventually believe it. Evil profiteering polluters falsely say that America has huge coal reserves that “at current consumption rates” will last for hundreds of years. That deceptive phrase is the basis of their obviously-misleading mathematically incorrect statement. We need to do the math ourselves - NOT believe them at face value by blind dumb faith. Figures don't lie, but big bad lairs can figure and fool almost everyone. Basic TRUTHS: The current price of coal production is increasing. The easy-access coal has already been depleted, and it is becoming much harder to extract what is left. The damage now being done by coal mining to our fragile environment is enormous. Mining has always been deadly dangerous for miners. How many more will we continue to kill? Fossil-fuel air pollution is now killing three-million innocent people a year, and lowering the quality of life for billions. Do profiteers care at all? And to top it all off, every scarce dollar that society spends increasing our addiction to burning anything is a shortsighted waste of capital on the unsustainable. The real-world mathematical problem is that for 150 years, American coal consumption has always had about a 7% compound growth rate, which DOUBLES CONSUMPTION EVERY TEN YEARS. In general, inefficient American energy gluttons have doubled ALL energy consumption roughly every ten years. If we continue to double and redouble coal consumption at the RECENT 7% compound growth rate, we will destroy our environment, and absolutely run completely out of all recoverable coal in America in roughly 40 years or so – NOT the deceptive 500 or 1,000 years that have been falsely claimed by biased liars! Radically reducing the rate of fossil-fuel consumption, and never building anything that burns it, may extend the life of this finite resource a bit longer. If $5+ per gallon gasoline bankrupts our transportation system (as predicted very soon), and forces us to use rechargeable all-electric vehicles powered by coal-fired electricity generation, we will surely run out of all of our finite dirty coal reserves in less than one generation! Anyone who disagrees clearly does NOT understand grade-school “times tables” or “goes intos.” Do you? Things that INCREASE UNSUSTAINABLE human population growth rate: End of war / baby boom, sufficiency / prosperity, immigration, increased longevity, healthy well-balanced nutritious organic food, high-quality low-fat protein, vitamins, antioxidants, omega-3 essential fatty acids, HDL cholesterol, excellent abundant universal health care, healthy exercise / lifestyle, anti-aging / disease-prevention education, pleasant disposition, joy of life, purpose, positive vision of the future, intoxicants / immorality / promiscuity / reduced sexual inhibitions, teaching that contraception is a sin, treating uneducated women as property. All of the above good-and-bad things are now making our worldwide overpopulation problem WORSE. Things that REDUCE human population growth rate: War, religious fanaticism, hatred, bigotry, crime / murder, executions, assignations, corruption, famine, floods, drought, climate change, environmental damage, pollution, man-made toxic chemicals, biocides, radioactivity, preservatives, carcinogens, cooking food above 250 degrees F, loss-or-overcrowded human habitat, reduced longevity, starvation, contaminated food / air / water, LDL cholesterol, high blood pressure, negative stress response / lack of coping skills, bad jobs, child abuse, red meat, sugar, high-fructose corn syrup, excess calories, insufficient exercise, obesity, oppression, despair, burdensome debt, economic collapse, job loss, homelessness, suicide, euthanasia, rebellion / revolution / riots, deadly disease, microorganisms, poor-or-no health care, greedy profiteers, for-profit health insurance, health-damaging drugs (prescription and illegal), iatrogenic medical-profession errors, self-destructive age-accelerating lifestyle, non-learning stupidity, smoking anything, unsafe transportation / infrastructure, sexual restraint, birth control (voluntary or government enforced), abortion, sterilization, educating women and giving them good income opportunities and fair equal rights. All of these bad-and-good things REDUCE our worldwide unsustainable overpopulation crisis. of most of these terrible population-growth-rate reduction options. strategic future worldwide sustainable lifestyle strategy. The one child receives much-more love, attention, care and training than some do in large families. Failure to comply with China's one-child mandate can result in fines, government-forced abortion, or sterilization. Which of the above do YOU choose to do? The right things seem obvious to me. Nature WILL! Inaction is both immoral and suicidal for all of humanity. China has over 600 million people living in crowded urban environments - That is twice the number of total all people in the USA. China believes that 350 million of their people will move from the country-side to large cities in the next 10 years. That is more than all houses and workplaces in the entire USA - equivalent to building Ten New York Cities EVERY YEAR. What has taken America over a century to build, China must aggressively do in only one decade. China must build ten new sustainable megacities with 35 million people each over the next ten years, OR alternatively, 100 cities of 3.5 million each. That is about the same as building one new city the size of Los Angeles every month for the next ten years. Overpopulation has already created unprecedented pervasive problems for obsolete-thinking community planners. Radical reinvention is long overdue. Ineffective GREENWASH is not moving nearly fast enough to keep up with population growth. China does NOT have enough trees to build wooden homes for 350 urban residents. In only a few years, China is about to destroy the last of their native poplar trees - just to make totally-unsustainable disposable chopsticks. China must innovate the use of TREE-FREE CONSTRUCTION. They need net-zero-energy buildings that generate more energy per year than they consume. They need urban communities that produce more high-quality nutritious food than they eat. AND, they have to do it all with Zero Emissions - Never burn anything - or 950 million people will suffocate in crowded unsustainable megacities. America has a LOT to learn from the way China is now reinventing their megacity future. One major problem is that there is NO exemplary city anywhere in the world today that should be imitated in the future. The 20th century thinking that created today’s monstrous megacity mess cannot possibly solve the huge problems that it created. Worldwide, nearly 90 million more people may inhabit the Earth every year, unless there is a major natural-or-man-made life-extinction event. If current trends continue, the vast majority of these new inhabitants will want to live in crowded urban areas. Current megacity inefficiencies make this prospect completely infeasible and unsustainable. Will the grossly-inefficient 20th century megacity model be feasible for 21st century new construction? ABSOLUTELY NOT ! It is extremely important that Emerald Eco-City demonstrate tomorrow’s megacity prototype, BEFORE the world builds even one more disastrous imitation of the serious problems of the past. It seems like very few of the streets in London meet at a 90 or 180 Degree Angle, and the name of the street changes every block or so. It takes three years to learn how to be a cab driver in London. WHEN London floods (along with many other at-risk near-sea-level cities worldwide), what will the residents do? Should it be rebuilt exactly the same way somewhere else? Will inundated megacities repeat random unoptimized chaos and extreme urban inefficiency forever? What will eventually trigger radical reinvention of megacity efficiency and lead to true environmental sustainability? 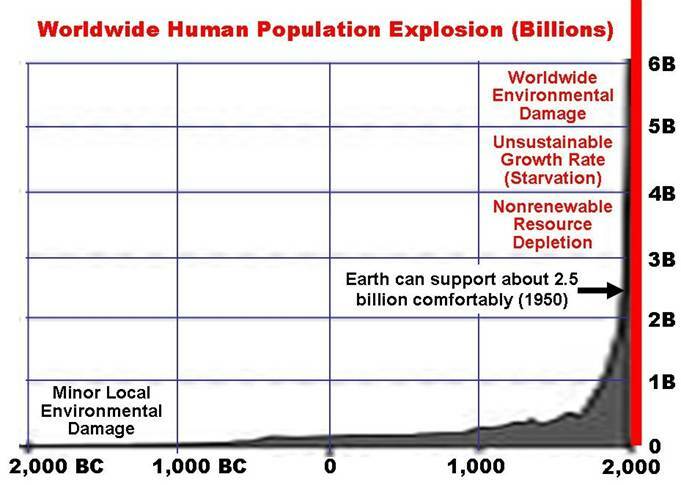 It took from 1997 until 2009 (a dozen years) for world population to explode from 5.8 to 6.8 billion people. All things considered (births, wars, murders, famine, starvation, lack of clean fresh water, and deadly diseases), the next one-billion humans are predicted to be here by 2023. We can argue and speculate about the exact date, but the historical population growth trend is clearly established, and well documented scientifically. IF half of the next one billion humans continue (or accelerate) the urbanization trend, Earth will need an additional FIFTY NEW MEGACITIES of 10 million people each, which do NOT exist today. If they all live in cities of one million each, we will need 500 NEW CITIES BY 2023. How will we make unprecedented urban explosion happen in such a short period of time? It is now reasonable to believe that this population + urbanization trend is HIGHLY PREDICTABLE (unless at least 20% of humanity is wiped out by man-made nuclear destruction, a huge meteor strike, unstoppable plague, climate change, etc.). Do you know ANYONE who has a rational, BELIEVABLE plan in place to construct 50 new cities of 10 million each, OR 500 new cities of 1 million each by 2023 ? ? ? Zero Energy Design DOES – It is called Emerald Eco-City. We need the first working prototype IMMEDIATELY. 2010’s 5-year-olds will graduate from high school (if they don’t drop out) by 2022. What kind of environmental legacy and opportunities will be available for them? Will there be any living-wage new jobs, or places for them to live? Will we have outsourced all of our good jobs and money-making technology overseas? Will China, Japan, and OPEC foreclose on the many loans they have granted USA? Will U.S.-Dollar-based assets become worthless? Will America in the 21ST Century go the predictable way of all previously-failed democracy experiments before us? All this may eventually come to pass, IF we ignore Objective Zero Sustainability for yet another decade. Will new urban areas randomly spring up chaotically for the next generation, in the same haphazard way that today’s inefficient, unoptimized, UNSUSTAINABLE CITIES have done, to the detriment of the entire worldwide environment and worldwide resource depletion ? ? ? Today’s explosive urban growth trends are TOTALLY UNSUSTAINABLE for our children's predictable future. SMALL incremental improvements to today’s insufficient man-made community infrastructures can NOT begin to satisfy a world with 7.8 billion humans (in about 2023). Communities-as-usual are going to undergo a rapid catastrophic collapse in less than one generation (15 years). Simply changing a few light bulbs, recycling a fraction of our mountains of disposables, increasing miles per gallon, and reducing greenhouse gas emissions by small fractions, are beyond any doubt FAR TOO LITTLE, FAR TOO LATE. We MUST have a cost-effective, extremely-efficient, pragmatic, practical, WORKING PROTOTYPE of an Emerald Eco-City AMOST IMMEDIATELY, with Objective Zero (OZ): ZERO Emissions – Never Burn Anything (no coal, no oil, no gas, no biofuel, and no nuclear waste), ZERO Pollution, ZERO Crime, ZERO Poverty, ZERO Energy – Self Sufficiency, ZERO Waste, and ZERO Impact – NO Disposables, NO Landfill, Cradle-to-Cradle Design of Everything. Partial slow baby steps simply will not do. Small reductions in existing bad lifestyle habits can NOT possibly work. When we fully comprehend the situation we are NOW IN, we will realize that we MUST THINK BOLDLY, and ACT BOLDER THAN HUMANITY HAS EVER DONE BEFORE. Don’t let anyone make you settle for less than the very-best OZ. Sustainable Eco-Cities are A MILLION TIMES MORE IMPORTANT THAN THE $125 BILLION (in today’s dollars) THAT WE SPENT TO SEND MEN TO THE MOON, or the terrible investment that was required to win World War II. 50 megacities of 10 million people, or 500 cities of 1 million will cost mega billions in less than 15 years – An unimaginable astronomical sum by any modern measure. The U.S. Census suggests that in 1900, there were 76 million people living in America. Population grew rapidly to 122 million by 1930, triggering The Great Depression. There was insufficient water for one third of America. Over-grazing and over-extraction of scarce water created the Dust Bowl Desertification . It literally took decades to recover, and yet, our non-learning nation is re-making many of the same Great Depression mistakes today. The 2008 Great Recession was merely a small hint of how we have ignored overwhelming scientific environmental predictions, and proven off-the-shelf solutions, for many decades. In only about one generation, America will add an ADDITIONAL 100 million residents (many of them here illegally). Half will want to live in urban sprawl that does not even exist today. We are doing almost nothing to control over-population, and massive non-renewable-resource depletion. (Do you know what “UNSUSTAINABLE” means?) USA disaster is approaching haphazardly, with no rational plan for predictable-catastrophe mitigation. It is precisely following historical trends that have been ignored for far too long. What will we do with “only” 400 million people? How will we do it? When will we start? The longer we wait, the more traumatic the situation will surely become. Should the world thoughtlessly allow 20% of humanity to starve to death without food, water, or a home? 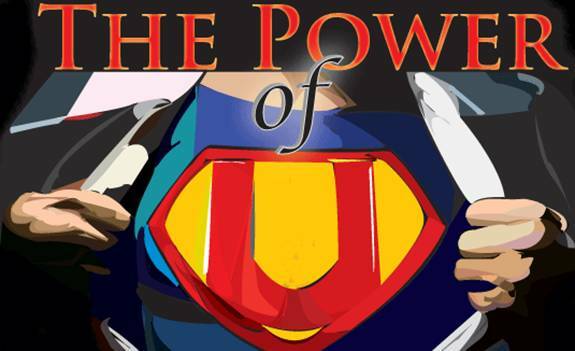 Do you think you are invincible, and that it will not impact your family? One billion are already famished worldwide, why not many billions more? What can possibly prevent it from happening, based on well-documented current trends? Is anyone listening? Does anyone care about their OWN grandchildren’s future? The unprecedented motivation for Emerald Eco-City that we just presented above is not even one half of the huge problem that we MUST solve very soon in the 21ST Century. Let’s assume hypothetically that thousands of worldwide climatologists are correct. And that the predictions about near-future sea level rise are accurate (from the kind of NASA scientists that successfully sent men to the moon, with far less computing power than we have available today). What IF sea level really does rise and a billion people (living in at-risk urban areas near sea level, like New York, et .al.) become homeless at about the same time? In addition to the new cities required to accommodate predictable population growth + urbanization, a billion displaced coastal city dwellers will need 100 new megacities of 10 million each, OR 1,000 new cities of 1 million each that DO NOT EVEN EXIST TODAY ! Can anyone in the entire world (with functional powers of observation) be so ignorant as to believe that we do NOT need at least ONE Objective Zero / Emerald Eco-City working prototype to demonstrate to worldwide city planners the potential of fully-integrated, 3D-optimized, COST-EFFECTIVE Sustainable Objective-Zero Eco-Cities of tomorrow? Can YOU begin to realize the FANTASTIC MOTIVATION for our compelling Emerald Eco-City vision to become the largest human construction project in history, AND humanity’s MOST SUCCESSFUL UNDERTAKING EVER ? ? ? How enthusiastic will YOU be? Will you merely talk about it and tell your influential friends and government representatives? OR, will you play a critical role in making it happen QUICKLY? If you apply the same stinkin’ thinkin’ selfish evaluation criteria that created our crisis, to how to correct it in the future, the best-possible Objective Zero criteria will sound WHACKO. Naysayers, foot draggers, curmudgeons, unenlightened Architects / Builders / City Managers, corrupt politicians, health care profiteers, and greedy special-interest fossil-fuel-based humanity killers need not send us any of their purely DESTRUCTIVE thoughts. We know that we have a solid track record of doing what others thought was impossible. We don’t have time to argue with the intransigent sources of today’s many self-imposed suicidal crises. But, we very-much look forward to interacting extensively with everyone who offers POSITIVE supportive refinements to our Compelling Emerald Eco-City Vision. We know full well that “We stand on the shoulders of intellectual giants.” We would have achieved very little over the last three decades without them. So it will continue to be in our future. Zero Energy Design® now claims to be World’s Foremost Strategic-Solution-Integration Experts – Please help prove us wrong – Do something even better. Emerald Eco-City MUST become the largest, best-and-brightest collaboration of all time. We want to eliminate any flaws and oversights immediately, well before construction begins. Overcoming deeply-entrenched resistance to change requires that our vision and message must become bullet proof, and irresistible to all. Never before has a catastrophic crisis created such a wonderful opportunity to change the entire world for the better. This monumental effort is far too important to fail. It will take everything that all of civilization has learned up until now to make it happen correctly and quickly, before it is far too late (which may have been last year). What are your questions? We invite and appreciate suggestions from our new friends.